BANGKOK: The public prosecutor’s decision to drop five charges against construction tycoon Premchai Karnasuta has been met with fierce criticism. 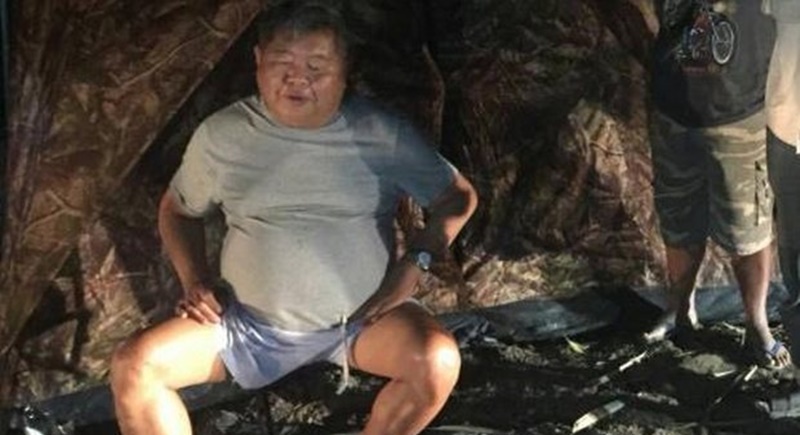 Social media has been flooded with angry questions after the Office of Public Prosecution Region 7 announced its decision yesterday (Apr 4) to drop almost half of the charges against Premchai. The president of Italian-Thai Development and three of his friends were arrested on Feb 4. They were charged with poaching in the Thungyai Nareusuan Wildlife Sanctuary, a Unesco World Heritage site, in Kanchanaburi province. Somsri Wattanapaisarn, director-general of the regional public prosecution office, read out the prosecution office’s decision. Prosecutors decided to press on with six charges against Premchai. These are carrying firearms in public without permission, colluding to hunt wildlife in a wildlife sanctuary without permission, hunting protected wildlife without permission, possessing protected wildlife carcasses without permission, concealing wildlife carcasses obtained illegally, and collecting wildlife items in a national forest reserve without permission. The five charges dropped were entering a wildlife sanctuary without permission, possessing wildlife-hunting tools, attempting to hunt wildlife in a wildlife sanctuary without permission, committing cruelty to animals, and possessing firearms and ammunition without permission. The other three people charged in the case are Italian-Thai Development employees Yong Dodkhruea, Nathee Riamsaen and Thanee Thummat. Yong faces the same charges prosecutors resolved to press against Premchai, plus an additional charge of colluding to possess firearms and ammunition without permission, Ms Somsri said. Nathee, who served as a cook during the poaching trip, faces almost all the charges recommended by the police, except for the one for colluding to hunt wildlife, Ms Somsri said. Thanee faces the same charges Yong does, plus another charge for colluding to hunt wildlife, she said. Financial compensation for the four defendants’ alleged violation of the Environment Act will have to be pursued in a civil suit, Ms Somsri said. “If Provincial Police Region 7 agrees with the charges, the case will be forwarded to Thong Pha Phum Provincial Court and the suspects will be arraigned. If not, the Office of the Attorney-General will make the call,” Ms Somsri said. Prosecutors will draft the indictments while they await reaction from the police, she said. Deputy police chief Srivara Ransibrahmanakul said police would send a letter to object to the decision. “Police remain steadfast in our original decision [to press 11 charges]. However, we somehow accept the public prosecutor’s decision to drop charges on colluding to commit cruelty to animals and colluding to possess firearms and ammunition without permission,” Gen Srivara said. The Office of The Attorney-General Immediately came out to defend the Office of Public Prosecution Region 7’s decision. “Contrary to criticism in social media, public prosecutors did not drag their feet or try to delay the case. They worked swiftly, fairly, cautiously,” Prayuth Phetchkhun, deputy spokesperson of the Office of the Attorney-General told journalists. A major conservationist group monitoring the case also accepted the public prosecutor’s decision. “We are not surprised by the public prosecution’s decision. 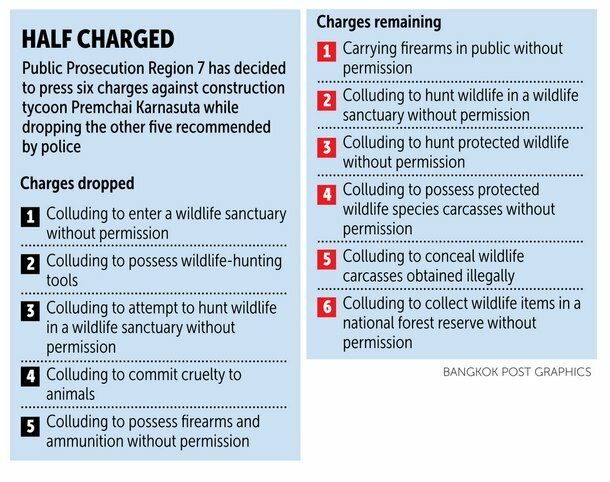 Despite five charges being dropped, public prosecutors still press six charges relating to hunting protected wildlife,” said Ornyupa Sangkama, chief of the academic section and an environmental law expert at Sueb Nakhasathien Foundation, a respected conservation group that closely monitored the case. Seems like the cook was the ringleader of the whole affair! Wow!